Fractures involving the hamate hook account for less than 2% of all carpal fractures yet can be the source of significant morbidity if unrecognized or undertreated.1,2 Athletes often present following direct blows during sporting events, such as a check swing in a baseball player's bottom hand, the racket hand in a tennis player, or a golfer's top hand during a mis-hit shot. These injuries can also occur after indirect trauma, such as a fall on an outstretched hand. Patients present with ulnar-sided palmar wrist pain aggravated by grasp and a positive result on hook of hamate pull test.2–4 Traditional anteroposterior and lateral views of the wrist fail to adequately show the fracture.5 A carpal tunnel view can be helpful but is often difficult to properly obtain in the acute setting secondary to pain elicited by dorsiflexion.5 The senior authors' (B.L., R.G.G., G.M.L.) preferred technique for confirming the diagnosis is a thin-cut computed tomography scan with a focus directed at the axial cuts through the hamulus. A subset of athletes present with incomplete fractures, also termed stress fractures or partially united fractures.8,9 Overall, there are only 9 case reports discussing incomplete fractures. The authors define incomplete as being nondisplaced, often with sclerosis around the fracture edge and an incomplete nature. These fractures are often delayed in their diagnosis, as they can present without a single definable event and many times present with chronic symptoms and decreased performance level. The limited literature on the topic makes management decisions particularly difficult. The authors present the largest series to date of incomplete fractures of the hook of the hamate, their course of treatment, and outcomes. From January 2000 to November 2016, 143 hamate hook excisions were performed at 2 centers. Of these 143 excisions, 17 were performed because of a preoperative diagnosis of an incomplete fracture. The inclusion criteria used to make the diagnosis were as follows: (1) history of ulnar-sided wrist pain; (2) positive result on hook of the hamate pull test—the elicitation of pain over the hook of the hamate with the wrist in full ulnar deviation with a pull exerted on the flexed long and small fingers8; and (3) computed tomography or magnetic resonance imaging findings of an incomplete hook of the hamate fracture. Plain radiographs, including carpal tunnel view,8 were obtained for all patients in this series. Computed tomography scans were obtained in the axial prayer position, as described by Egawa and Asai,5 or with traditional bony axial cuts to delineate the injury. A retrospective review was conducted to determine age, sport, definable event, mechanism, level of play, initial diagnosis, hand dominance, any preoperative treatments, and time to return to sport. Delay in diagnosis and time from injury to surgery were calculated and compared between the group of referral patients and the group of primary (nonreferral) patients. Using this calculation, time from injury to return to sport was extrapolated. The mean age of the patients was 24.4 years (range, 14–58 years). All patients were male. 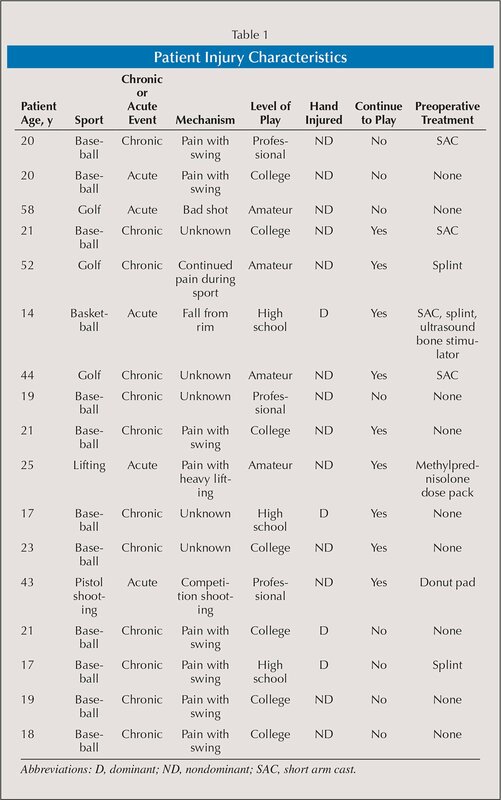 All but 4 injuries occurred in the nondominant hand, with a greater preponderance of these injuries occurring in the nondominant hand of elite baseball players (Table 1). Mean follow-up was 50.3 months. Of the 17 patients, 13 had an initial diagnosis of hook of the hamate fracture. One patient was diagnosed with a wrist injury and another with extensor carpi ulnaris tendinitis. Two were initially diagnosed with a hand sprain. Ten patients were referred to the senior authors (B.L., R.G.G., G.M.L. ), with 7 being primary patients. Five patients were able to continue to play prior to evaluation, albeit at a lower level. All 17 patients required advanced imaging (ie, computed tomography scan or magnetic resonance image) for definitive diagnosis of incomplete fracture. Eight patients were initially managed nonoperatively with a variety of methods, including casting, splinting, a steroid dose pack, and a donut pad. Union was not achieved with conservative management in these patients. Of the 10 patients referred for definitive care, 7 underwent a trial of nonoperative management yet failed to have union. In the group of referral patients, the mean time from diagnosis to surgery was 9.4 weeks. In the group of primary patients, the mean time from diagnosis to surgery was 5.5 weeks (Figure 1). Axial computed tomography scan showing incomplete hook of the hamate fracture in a 20-year-old elite baseball player. 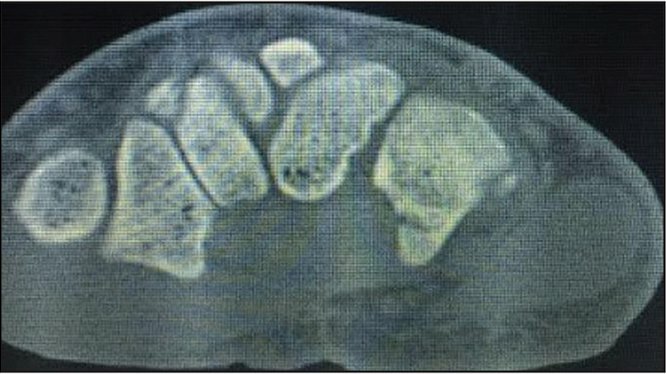 This is the largest case series to date of incomplete hook of the hamate fractures. In the limited previous literature, all cases were initially managed nonoperatively. The authors' approach of prompt excision achieves the goal of definitive treatment with an efficient return to sport. The over-all mean time to diagnosis in this series was 11.1 weeks from time of symptom presentation, with a mean delay in surgical treatment of 6.2 weeks following diagnosis. When patients were seen by 1 of the senior hand surgeons initially, the mean time from diagnosis to surgery was 1.5 weeks. Compared with those patients seen as a referral, there was a 7.9-week difference in return to sport secondary to delayed surgical treatment. Given the failure of all cases managed nonoperatively, the authors now recommend excision as the first-line treatment in cases of incomplete hamulus fractures in competitive athletes. Hook of the hamate fractures have been shown to occur in athletes, particularly golfers and baseball players.1,3,5 The etiology for this predisposition is thought to be the transmission of direct forces to the volar prominence of the hamate, which is intimately close to the grip of a baseball bat or golf club.1,3,5,7,8,10,11 To date, there is a paucity of literature available regarding patients and outcomes of incomplete fractures of the hamate. David et al8 described a series of 8 patients diagnosed with partial union of the hook of the hamate fracture. In this series, 7 underwent successful excision of the hook of the hamate without surgical complication.8 The lone complication was transient first dorsal interosseous weakness and postoperative claw deformity of the ring and small fingers attributed to contusion of the motor branch of the ulnar nerve, which resolved by 4 months postoperatively. Similar to this cohort, the current authors had 1 postoperative ulnar nerve neurapraxia, which resolved by the 2-week postoperative visit. Guha and Marynissen9 reported an isolated case of a stress fracture in a 33-year-old recreational tennis player following a change in serving mechanics. This resolved successfully with bracing for 3 weeks followed by plaster casting for an additional 3 weeks. Devers et al4 reported successful return to preinjury sports performance level for 12 high-level amateur athletes with hook of the hamate excisions. For the current study's elite baseball players, once 85% grip strength—compared with the contra-lateral side—was attained, they were allowed to begin light tee work, progressing to full swings as tolerated. In this study, patients returned to sport at a mean of 6.8 weeks following definitive surgical treatment with excision of the incomplete hamulus. Along with the need to expedite the return of the high-level athlete to preinjury levels of play, nonoperative management of hamulus fractures is not without risk. Milek and Boulas12 described 4 patients with flexor tendon rupture secondary to hook of the hamate fractures.13 In a high-level athlete, whether high school, college, or professional, this could have devastating consequences. The authors' surgical technique involves an approach from the radial aspect of the pisiform to approximately 1 to 2 cm distal to the hamate hook. The transversely oriented muscle fibers of the palmaris brevis are next identified and released to visualize the ulnar nerve. The deep motor branch of the ulnar nerve is identified after dividing the fascia of the flexor digiti minimi and opponens digiti minimi. The motor branch is carefully protected throughout the remainder of the procedure. The pisohamate ligament can then be identified and followed to the palpable hamate hook, which can easily be confirmed on fluoroscopy if desired. The periosteum of the hamate hook is then elevated and the transverse carpal ligament is released from the radial border of the hamate. Following excision of the hamulus, the base is smoothed with a rasp and bone wax is applied. Finally, the flexor tendons are inspected for any evidence of fraying. The current authors contend, much like David et al,8 that incomplete hamulus fractures may be stable enough not to displace the fragment but do not stablize the musculoligamentous complex that attaches to the hamate, causing continued pain and decreased athletic performance. It is possible that some of the patients may have had a partially united hamulus fracture, or could have had an injury similar to a stress fracture as reported by Guha and Marynissen.9 Although a weakness of the study, the authors believe that this does not distract from the overall message that nonconventional fractures of the hamulus are at high risk of failing nonoperative management and should be aggressively excised to facilitate return to sport. Another potential limitation of this study was that cases were based on surgical Current Procedural Terminology codes. There may have been cases that were effectively managed without surgery that were either not referred or not recognized. In the senior author's experience, these fractures do not heal. Therefore, the authors believe that this limitation, although present, is small based on the natural history of hamulus fractures. Injury to the hamulus should be considered in any patient who reports ulnar-sided wrist pain following any activity involving baseball, softball, golf, or racquet sports. A thorough clinical examination, including a hook of the hamate pull test, should be performed on these patients. Initial radiographs should include standard anteroposterior and lateral views of the hand as well as a carpal tunnel view. If these extensive radiographs are inconclusive, strong consideration should be given to computed tomography scans with a focus on axial cuts. The diagnosis and definitive management of these injuries is often difficult and delayed. The data suggest that these injuries are prone to fail nonoperative treatment and should be excised promptly when the goal is return to sport. This approach expedites return to preinjury participation, minimizes risk for long-term sequelae such as flexor tendon rupture, controls pain, and returns these patients to sport in a timely fashion. Fredericson M, Kim BJ, Date ES, McAdams TR. Injury to the deep motor branch of the ulnar nerve during hook of hamate excision. Orthopedics. 2006;29(5):456–458. Hart VL, Gaynor V. Roentgenographic study of the carpal canal. J Bone Joint Surg Am. 1941;23(2):382–383. The authors are from Wellstar Atlanta Medical Center (JAB, GML) and The Hand and Upper Extremity Center of Georgia (GML), Atlanta, Georgia; and the OrthoCarolina Hand Center (BL, RGG), Charlotte, North Carolina. Correspondence should be addressed to: Gary M. Lourie, MD, The Hand and Upper Extremity Center of Georgia, 980 Johnson Ferry Rd NE, Ste 1020, Atlanta, GA 30342 ( gmlhtc@aol.com).